Aquatic therapy is a specialized form of therapy. Water improves motion and flexibility. The warmth of the water (93-94 F) allows muscles to relax while helping to reduce pain. The natural buoyancy reduces gravitational pull and lessens compressive forces, up to 90% reduction of your normal weight, hence making exercises much easier to perform than on land. Best of all, aquatic therapy can be used even if a patient does not know how to swim. 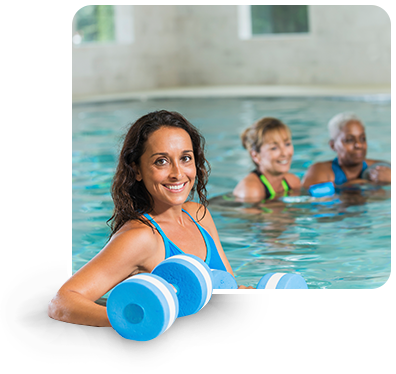 Water can be excellent environment for patients who have difficulty with weight bearing activities due to, recent surgery, arthritis, recent fracture, sprain/strains, or excessive weight. There is no other method of exercising available that creates a near zero gravity setting. Warm water facilitates muscle relaxation and increases peripheral circulation. Viscosity of water provides resistance for strength training. Warm water stimulates body awareness, balance, and trunk stability. The reduction of gravitational forces are reduced in the pool, allowing for early gait training and strength exercises without causing further damage to the healing structures. Warm water and buoyancy results in decreased pain sensitivity. Improvement of patient morale and confidence can be established by providing a positive medium in which to function.